Six blacktail deer stay together as a herd as they graze in the fresh, green grass around Mitchell cabin. The horses in the pasture next to mine at last have green grass to munch on. They had been hanging out as a group, but with patches of new grass here and there, they now spread out looking for the thickest clumps. Their enthusiasm for dining over a wide area makes me think they had gotten tired of eating together at piles of dried alfalfa. We’ve had 20 inches of rain in West Marin during the past two months, bringing the total for the season (July 1 to June 30) to 25.5 inches. In a normal year, West Marin would have received 40 inches by now. Many ancient Greeks and Romans believed that salamanders are born in fire. Some salamanders inhabit rotting logs, and when the logs were put in a fire, the salamanders would try to escape, leading people to believe that salamanders were created by the flames. The recent rains have not only turned the hills green again, they’ve brought back our nightly chorus of tree frogs. The frogs are loudest at two stockponds near Mitchell cabin, but some hop on over to my lower deck to chirp. This one is on bamboo growing in a wine barrel. A Pacific tree frog’s color depends on where it is at the moment. Immigrant flora and fauna next to Mitchell cabin. Daffodils are native to meadows and woods in Europe, North Africa, and West Asia, with a center of distribution in the Western Mediterranean, according to The Cultural History of Plants, a 2005 collection of scientific writings edited by Mark Nesbitt and Sir Ghillean Prance. Turkey hunting, however, has dropped off significantly in recent years, and in some parts of the San Francisco Bay Area, wild turkeys are becoming a problem in gardens and on roadways. Last year one bicyclist died when he crashed in Martinez trying to avoid a flock of the birds, The Contra Costa Times reported. The year before, a motorcyclist wrecked but survived when a turkey hit him on Interstate 680. And as I noted here a couple of weeks ago, a wild turkey blacked out the town of Tomales for four hours in 2005 when it flew into power lines over Highway 1 downtown. Nor was it the first turkey problem in Tomales. They were already considered pests because of their tearing up gardens and aggressively challenging schoolchildren. On one occasion turkeys lunged at two youngsters on scooters, and although neither was harmed, both were forced to abandon their vehicles and flee on foot. 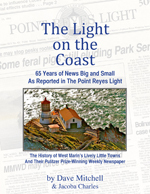 A Point Reyes Light article on the blackout (which, of course, is quoted in our new book, The Light on the Coast) reported: “Tomales residents’ efforts to get rid of the turkeys have met with little success. The Marin County Humane Society deals only with domestic animals, and Fish and Game refuses to relocate turkeys until an Environmental Impact Report is completed. Sparsely Sage and Timely is powered by	WordPress 4.9.10 and delivered to you in 1.256 seconds using 55 queries.